Andrew Trimble has urged his Ireland team mates to focus on the opportunity in front of them rather than dwell on last weekend’s disappointment in Johannesburg. Ireland were 20 minutes away from a series win at Ellis Park, but let a 16-point lead slip to lose the second Test to South Africa and set up a decider in Port Elizabeth on Saturday. 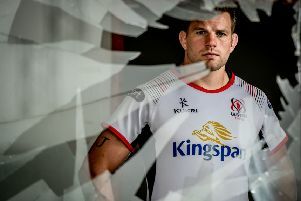 The tourists have been recovering from the bruising nature of the 32-26 defeat as they enter the final leg of their season in the seaside city on South Africa’s Eastern Cape but the Ulster winger has not lost sight of the fact that the scenario remains the same a week on. “It’s important that we get some perspective back and just remember that we still have a great opportunity to create a bit of history,” Trimble said. “We’re probably more aware now than we ever have been with how tough it’s going to be, how physical they are, how fast South Africa are. “Whenever they click, they’re very, very difficult to stop. We’ll have to look at a few things to figure out how to stop that. “We’re aware that we can be a quality side and win Test matches. “We can come to the southern hemisphere and win games, but there’s no point in us talking about that, we need to prove that and back that talk up. “We did that in Newlands, we showed an awful lot of character and dug in. We played some really good rugby that we’re really proud of, but to be taken seriously, you need to back that up and we didn’t do that at the weekend. The problem for Ireland will be summoning one last effort in their 17th and final Test match of a long season. “We’re pretty knackered,” Trimble conceded. “It was a tough battle out there, very physical and very fast. The first half especially, a lot of running down my side. Ireland found themselves off the pace in the final quarter last weekend as the South Africans went through the gears and played their power-game and Trimble wants to see his team match their hosts in the collisions at the Nelson Mandela Bay Stadium. “There’s a lot of things we need to take on board,” he said. “Really, we’ve got to start winning the collisions, we’ve got to start getting our spacing right and getting into position earlier so we can get more organised. Both sides are named today, with South Africa coping without Duane Vermeulen, Trevor Nyakane, Lood de Jager and Patrick Lambie. Ireland have lost Robbie Henshaw for the final Test, but they welcome CJ Stander back after his one-game ban. Jared Payne is understood to be a doubt for the decider.